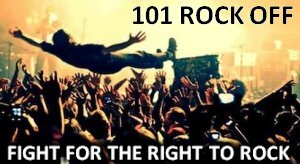 Rockin' 101 - ROCK OFF!" ROCKIN' 101 - ROCK OFF! Tune in weekday nights at 8:00pm for a new track each day and on Friday night to hear all four songs for the week. All four songs will battle it out each week for the right to rock for another week. Vote for your favorite band on the right. You can vote once per 24 hours and voting ends on Fridays at Midnight. Palaye Royale "You'll Be Fine"
Whitesnake "Shut Up & Kiss Me"
A Silver Lining "Redbull Vodka"
Scott Stapp "Purpose For Pain"
Dirty Honey "When I'm Gone"
Five Finger Death Punch "Blue On Black"
Motionless In White "Brand New Numb"
Take The Day "Take Everything"
Escape The Fate "Broken Heart"
Shaman's Harvest "Devil In Our Wake"
Shallow Side "Start A Fire"
Never Say Never "Trust Fall"
Deadset Society "Like A Nightmare"
Dead Horse Trauma "Left Unsaid"
Adelitas Way "Ready For War"
3 Pill Morning "Electric Chair"
From Ashes To New "Lost And Alone"
Saliva "Tragic Kind Of Love"
Sin City Escape "White Flag"
Doll Skin "Family Of Strangers"
Murder F. M. "We The Evil"
Awaken The Empire "Cross My Heart"
Sin City Escape "Running To You"
Fall To June "Delta Breakdown"
Cold Kingdom "Let It Burn"
Half Past My Sin "Crutch"
Gabriel And The Apocalypse "Until We Dream"